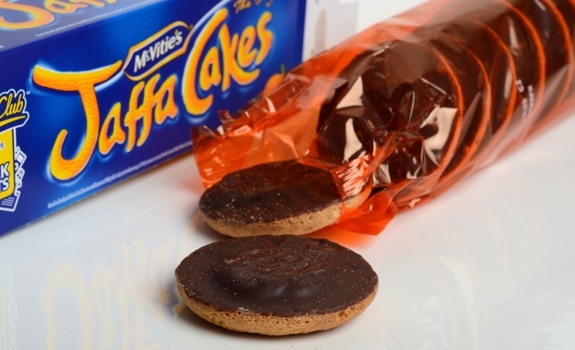 McVitie’s Jaffa Cakes, in their orange plastic wrapping. You can find them in Canada if you know where to look. Unless you’ve spent the past month in solitary confinement in a North Korean prison, watching the same two pirated I Love Lucy DVDs over and over again on a black and white T.V. you paid for with a kidney, you’re no doubt aware that there’s been a special occasion today on a small island nation just to the north of France. While I don’t fancy myself a royal watcher, I’m certainly a fan of British snack foods. From Double Decker bars to steak and onion crisps to digestives, the U.K.’s snacking culture has a style all its own. And so, to mark the occasion of the royal nuptials, allow me to introduce you to that curiously British treat, McVitie’s Jaffa Cakes. First off, let’s be clear. They may look like chocolate-dipped cookies, but they are NOT cookies. According to Wikipedia, there have been tax wars fought over this distinction. 1. Cake. 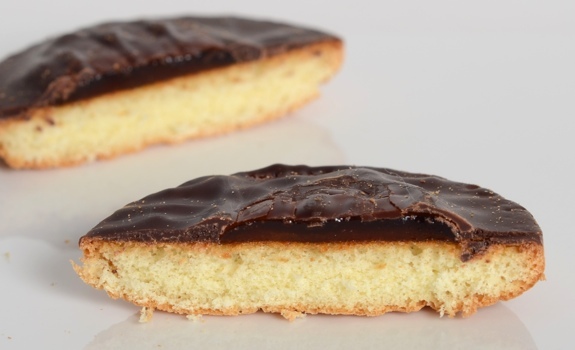 The core of each Jaffa Cake is a thin disc of spongy cake a bit more than two inches in diameter (about 55 mm). It’s light, soft, and fairly dry. It forms a dominant part of the texture, but not the taste. 2. Orange filling. It’s like a thickened jelly, with a zest-like orange character. It’s applied in a circle in the centre of the top of the cake, which is then dipped in chocolate. Without the orange filling, it wouldn’t be a Jaffa Cake. 3. Chocolate. The top of each cake disc is dipped in a thin layer of dark chocolate. You can see the bulge of orange jelly under the layer of chocolate. The bottom of the cake remains exposed, sans chocolat. So, there you have it. A quintessential British snack food. While I reckon William and Kate have eaten more than a few of these during their youth, I’ve never had the chance to ask them in person. But whatever. Enjoy your special day, you happy royal newlyweds, you. A cross-section of a McVitie’s Jaffa Cake. Cake on the bottom, blob of orange jelly in the middle, and a thin layer of chocolate on top. Cost: $3.95 for a box of 12 at Hub Cigar in Edmonton. They’ve got a nifty new British food section that’s just opened up. Value for cash money: Compared to the U.K. price? Not cheap. Compared to other cookies here? Not bad. It’s a special import item, so a premium price is expected. Availability: Check specialty import shops that carry other items from the U.K. These can’t be too hard to find in other large Canadian cities. In the U.S.? I haven’t a clue. Nutrition? : 46 calories per Jaffa Cake. Quite a bit of sugar, but not too much fat. The packaging says there’s only 1 gram of fat per cake. For a sweet treat, not bad. The verdict: I love, love, love these. Hmm, Hub Cigar, you say. While I have tried a couple McVittie cookies, I hadn’t tried their Jaffa Cakes. I’ve found a couple good Jaffa cakes at the Italian Centre South, oddly -well not really I suppose-quite a good one from Poland. They make a nice raspberry flavour & while I hadn ‘t seen it in some time(might’ve been discontinued)an Advocat brandy-inspired egg cream flavour which I really enjoyed. They are impossible to find in the US. I’ve had one box in my entire life. I have had Polish fakes that were adequate, and Belgian ones that were not. And now I can’t even buy those. I just found out that Amazon will sell them. Once the heat has died down I want to order some. I miss them terribly.